A relatively quiet stage today that was won by Enrico Battaglin in a sprint from a surprisingly large group. There were plenty of attacks on the final climb, but not from any of the bigger names. One of our picks, Stefano Pirazzi, attacked on both climbs, but seemed to be looking for mountain points, rather than the stage win. Stage 5 is likely to be one for the sprinters. The climb of Montescaglioso comes around 15km from the end and is where Marco Pantani famously attacked in 2003, blowing the field apart, but even then, there was enough time for the sprinters to get back onto the peloton and compete for the finish. It is not the most difficult climb and it would seem likely that this should finish in a bunch sprint, unless a group can get away on the climb and are allowed to go clear. You would imagine the likes of Argos-Shimano, Orica GreenEdge and Movistar will get on the front and look to try and drop the pure sprinters, particularly Cavendish, to set things up for Degenkolb, Goss and Ventoso respectively. 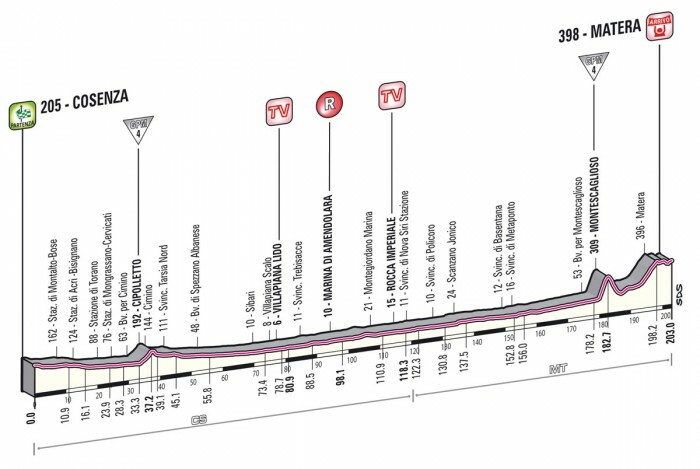 With so few sprint stages in this year's Giro, the importance of this stage to the sprint teams cannot be underestimated. Omega Pharma Quickstep will be doing everything in their power to keep Cavendish in the group on the final climb, possibly trying to set a reduced pace at the front, although this could invite attacks from the puncheurs. Obviously, if Cavendish is in the peloton at the end, he is the man to beat. However, someone like Giacomo Nizzolo could be one to keep an eye on, given his good recent form. If there is a breakaway on the final climb, the most obvious candidates come from the large group of Italians. Fabio Felline had terrible luck in the first three stages, but showed what he is capable of as he finished second in today's stage. He will not be troubled by this climb and is fast in the finish - indeed, he would be a runner if it finishes in a bunch sprint as well. Enrico Battaglin will be eyeing up a second stage win in successive days as well. He showed how quick he is to the line today and will certainly be in the mix tomorrow as well. 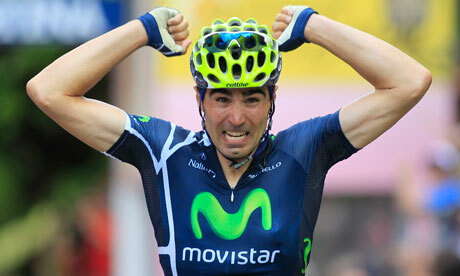 Potential other contenders might include the likes of Filippo Pozzato, Giovanni Visconti and Sacha Modolo. All of these have the ability to breakaway on the final climb if the pace is not high enough. Indeed, there are arguments for all of these. Visconti would appear to be targeting the KOTM jersey, and although there are not many points available, every point counts. Bardiani grabbed their first stage win today and Modolo is a decent chance for another as an alternative to Battaglin, while Lampre have had a tough race so far, so a stage win for Pozzato would be a welcome bonus at this early stage.